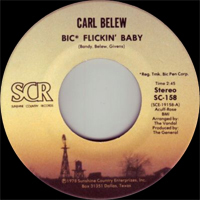 Chanteur US né Carl Robert Belew, le 21 Avril 1931 à Salina (Oklahoma). Carl Belew a débuté chez Sowder (56), puis il passe chez Four Star (56-58), Brunswick (58), avant de s'imposer chez Decca en 1959. Il connut de nombreux succès dans les sixties. 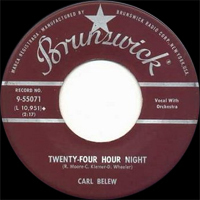 Carl Beliew est décédé le 31 Octobre 1990. 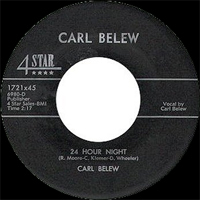 Despite recording eight albums between 1960 and 1972, Carl Belew is best remembered as a songwriter whose work was covered by an eclectic group of artists ranging from Patsy Cline to Gene Vincent to Andy Williams. Born in Oklahoma in 1931, Belew first entered the studio in 1955; by the following year, he gained his first widespread exposure thanks to appearances on a pair of California-based radio programs, Town Hall Party and The Cliffie Stone Show. 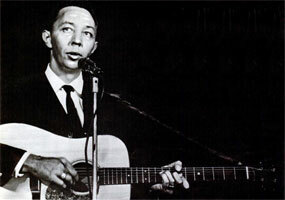 In 1957, he performed on the Louisiana Hayride. 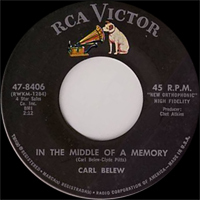 Belew's composition "Stop the World (And Let Me Off)" hit the Top Ten in 1958 in a rendition by Johnnie & Jack; the following year, Andy Williams hit the Top Five with "Lonely Street," a song which would become Belew's trademark tune thanks to subsequent covers by Cline, Vincent, and Rex Allen, Jr. Later in 1959,Belew wrote "Am I That Easy to Forget," a Top 40 pop hit for actress Debbie Reynolds that was later recorded by Engelbert Humperdinck, Skeeter Davis, Don Gibson, Jim Reeves, and Leon Russell. 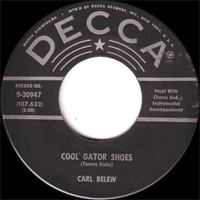 Belew's own rendition hit the Top Ten in 1959. In 1960, Belew released his self-titled debut LP; in the same year, he notched a Top 20 hit with the single "Too Much to Lose." 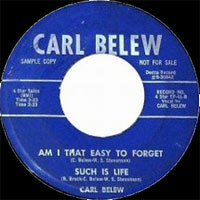 Two years later, a label change prompted another eponymous effort; the single "Hello Out There" earned him another Top Ten hit, his last. 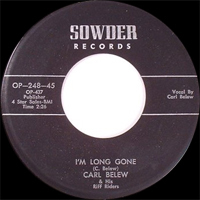 Between 1964 and 1968, Belew released an album a year, beginning with Hello Out There and continuing with Am I That Easy to Forget?, Country Songs, Lonely Street, and finally Twelve Shades of Belew. His last studio album, When My Baby Sings His Song, a record of duos with Betty Jean Robinson, was issued in 1972, while one final single, "Welcome Back to My World," appeared in 1974. Throughout his career, Belew's songs continued to be popular with (and popularized by) other singers; Eddy Arnold hit number one in 1965 with "What's He Doing in My World," while Jim Reeves scored a posthumous success in 1968 with "That's When I See the Blues (In Your Pretty Brown Eyes)." "Stop the World (And Let Me Off)" also reached the Top 20 twice more thanks to a 1965 cover by Waylon Jennings and a 1974 version by Susan Raye. 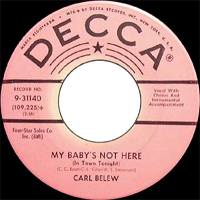 Carl Belew died of cancer on Halloween in 1990 at the age of 59. 1959 EP PATSY CLINE EP-43 (US) (promo) . 1964 SP HILLTOP G-9 (US) . Am I That Easy To Forget / ? 10/2005 CD KOCH 9881 (US) HITS PLUS ONES I'VE WRITTEN - Hello Out There / In The Middle Of A Memory / Crystal Chandeliers / Boston Jail / Walking Shadow, Talking Memory / Girl Crazy / Mary's Little Lamb / Odd Man Out / I Let Her Get Lonely / Even The Bad Times Are Good / Don't Squeeze My Sharmon / You're Driving You Out Of My Mind / How Long Is Forever This Time / The Closest Thing To Me / I Gotta Be Somewhere / Silent Partner / I Spent A Week There One Day / Help Stamp Out Loneliness / Am I That Easy To Forget?